The fire service is a truly an amazing profession built on a foundation of tradition, values, culture, and exceedingly high standards forged and maintained by many extraordinary people. January is National Mentoring Month, providing us with a perfect opportunity to reflect on the mentors that have helped shape us throughout our careers, reflect on our current protégés, and find new ways to influence others to be better every day through mentoring. There are generally two types of mentoring; informal and formal. Informal mentoring occurs between two people where one gains insight, knowledge, wisdom, friendship, and support from the other. Here either the protégé or mentor can initiate the relationship and many times, it just happens. Formal mentoring programs are the result of a significant investment of agency time and resources. Typically, a needs assessment, planning, program development, training and evaluation of mentor and protégé progress is necessary to assure success. The most critical aspect of a successful mentoring relationship is a positive interaction between the mentor and protégé. So what exactly is mentoring and how is it different than coaching? Typically, coaching is defined by the duration of a job task, skill, or event. The common goal of coaching is to improve a behavior or a performance of a task, while mentoring is not bound by a singular task, skill, or event. Mentoring is a long-term relationship focused on the holistic growth of the employee. According to the CPSE’s publication Refining Next Gen Leaders: Nurturing Leadership Through Mentoring, “mentors can serve as advisors, councilors, advocates, champions, and confidants” that focus on long term development. One important thing to remember when engaging in a mentor/protégé relationship is to establish the needs of the protégé through a comprehensive self-evaluation. Mentoring is not a one-size-fits-all approach and is dependent on a variety of variables that may include rank, professional goals, education, resources available, department support, family, background, type of department, just to name a few. If you decide on a formal mentoring program, ensure that you take the time to educate all members of your department on the process and intent. Specifically, plan for how assigned mentors can work with supervisors in the employee appraisal process to help meet department goals and ensure to communicate effectively. For many, mentoring may be new or seem like an unnecessary process. If the pairings you develop are not successful, and the employee has a bad experience, it can create uncertainty or make others less confident in participating. No matter the process used to pair, constant evaluation of the match quality and an assessment of whether the mentor is meeting the protégé’s needs is critical to the success of the program. I’ve had the honor of having many great mentors throughout my life. These mentors span all ranks, reach nationally from California to New York, globally to many other countries, and across the professional spectrum to contract, academia, private, and other non-fire service organizations. I still remember to this day meeting one of my mentors, Fire Chief Reggie Freeman, CFO, back in 2012. While I was at his department on a site visit, the informal mentoring process started early through various conversations on professional development, succession planning, and his personal successes and achievements. With his encouragement, six months later I was performing my self-evaluation for the CPSE Chief Fire Officer (CFO) credential and it changed the game. I learned a lot about myself and was able to identify some gaps in my overall development that I needed to plan for and work on. Throughout the process I frequently asked Chief Freeman for guidance or recommendations and eventually earned my CFO designation along with my Chief Training Officer (CTO) designation a year later. While the CPSE CFO designation is considered a career capstone by many, knowing what I know now, I realize it was only the beginning of a new level of growth, not the end of a goal. The network of like-minded, hungry professionals globally that have been designated forged many new mentor/protégé relationships and created so many other opportunities that expanded my professional contributions to the fire service as a whole, my community involvement, and my education and training endeavors, to name a few. One thing that I have learned over the years is that you should never underestimate the power of networking and relationships as you remain a protégé to some and serve as a mentor to others. Whether you are a thriving mentor or striving protégé, I encourage you to use all the resources at your disposal to give back. I recommend using the CPSE credentialing criteria found in the Fire Officer (FO), Chief Fire Officer (CFO), Chief Training Officer (CTO), Fire Marshal (FM), and Chief EMS Officer (CEMSO) applications as the gold standard for self-evaluation and goal creation. I have always believed that each person in the department should be, at a minimum, fully trained to the next level above them, so firefighters and engineers will gain a lot from using some of the criteria in the FO package to grow. Regardless of whether you are a formal or informal mentor, realize that there are unlimited opportunities to mentor someone throughout their career. Make a point during National Mentoring Month to reach out and develop a mentor/protégé relationship. If you want more information on developing a mentoring program I encourage you to visit www.cpse.org and check out their educational program “Nurturing Fire Service Leaders through Mentoring.” Let your legacy live through those that are coming up behind you! Center for Public Safety Excellence (2015). Refining Next Gen Leaders: Nurturing Leadership through Mentoring (2nd Ed.). Chantilly, VA: Center for Public Safety Excellence Inc.
Heifetz, R. and M. Linsky (2002). Leadership on the Line; Staying alive through the dangers of leading. Boston MA: Harvard Business School Publishing. 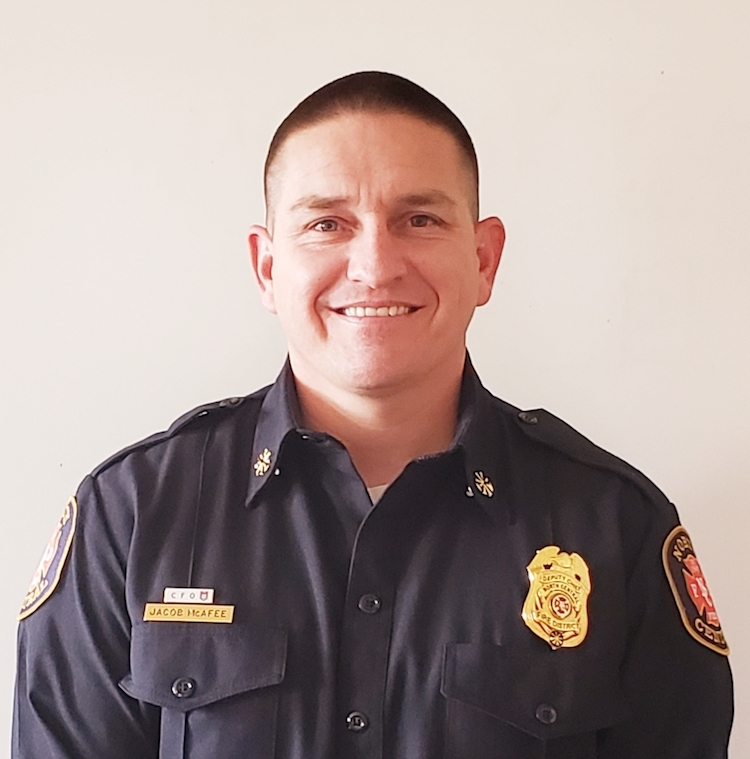 Jacob McAfee, EFO, CFO, CTO, MS, MIFireE, is the Deputy Chief of the North Central Fire Protection District in California and is also the Director of the Fresno City College Fire Academy. Previously, he was a Department of Defense Fire Chief, having worked as a fire service professional in the Marine Corps, Air Force, Army and Navy. Chief McAfee is an instructor for the California State Fire Marshal’s Office and the California Specialized Training Institute. He is a graduate of the NFA Executive Fire Officer Program and serves as a CPC CFO and CTO peer assessor and a peer team member for CFAI accreditation assessments. He holds a master’s degree in Occupational Safety and Health and Emergency Management and is pursuing his PhD in Emergency Management.